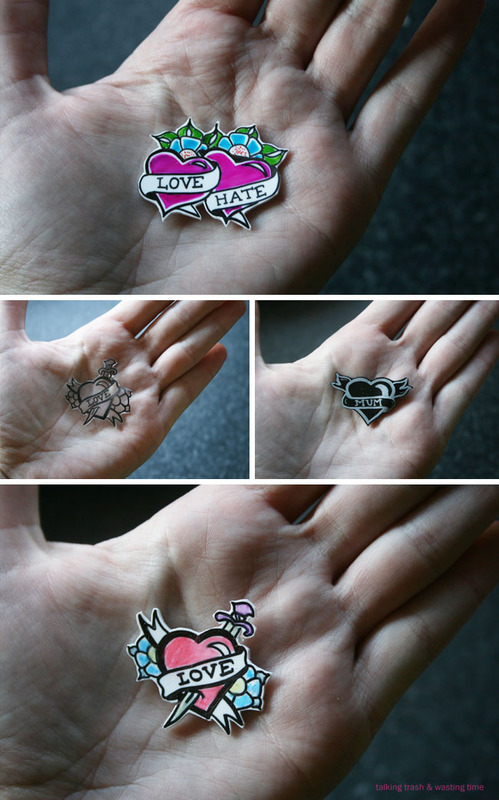 There is a few brands available, Shrinky Dinks is the most common. 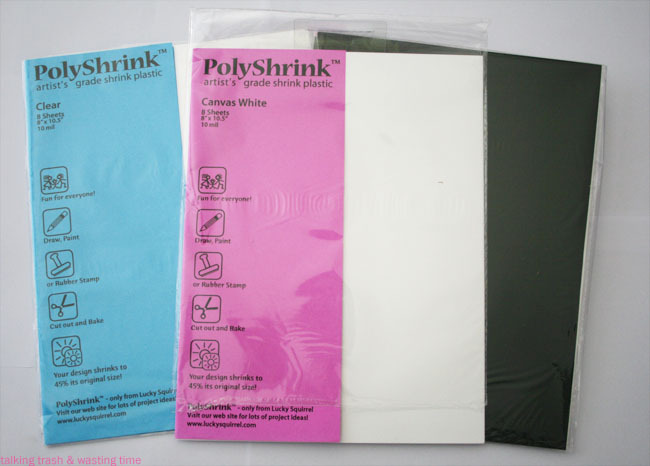 I use a brand called PolyShrink as I just find I like this better, but whatever you can get from your art supply or scrapbook shop is fine. 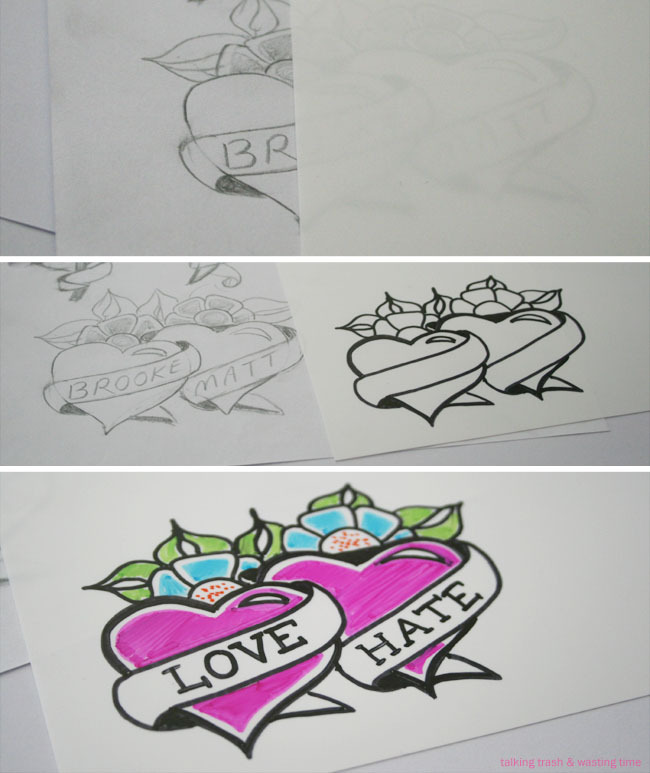 Draw up some designs on some paper or print them off from your computer. This can be anything you like, from a band logo to a cartoon of your dog. 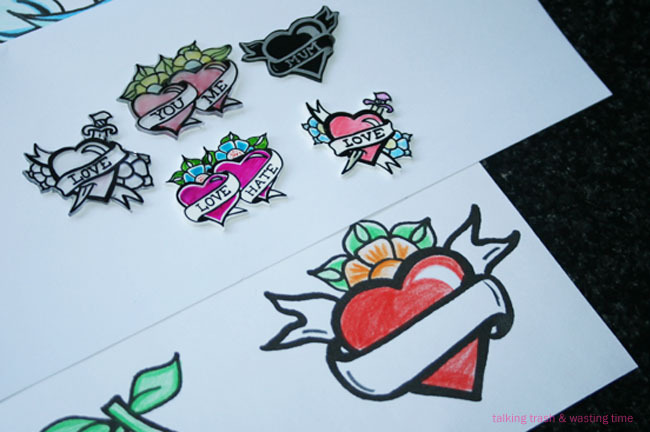 I just used old designs I had in my folder of some heart tattoo flash. There is a large range of plastics to choose from. Above is the clear, white and black. I tend to like the white as I find it gets the best results for me with my techniques but I have seen some amazing things done with other colours including the clear. Before you start lightly sand all areas on plastic you are going to use, I forgot this step and remembered to late to do it so my pencils & pastel chalks did not get the best result. Above is using permanent markers on white plastic. 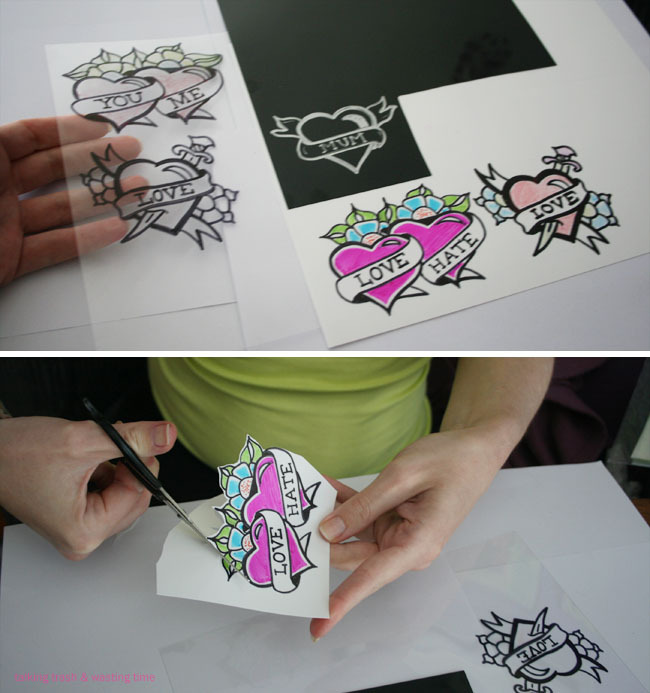 - First you trace your design onto the plastic with a black marker. 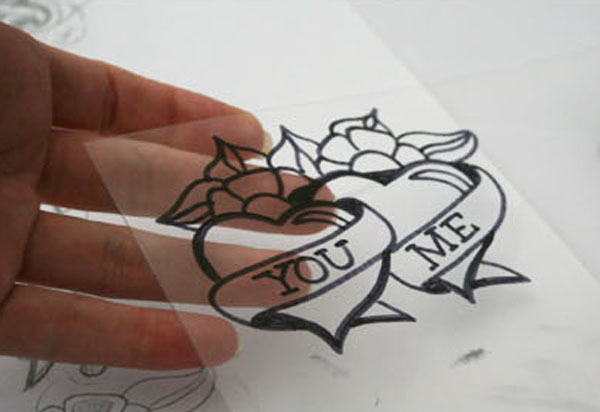 If you can not see your design through the plastic you can use a light box. - Colour in with desired permanent texters. The best results is when you use contrasting colours. Above is using the chalks on clear plastic. I think if you are going to use the chalks I would suggest using the white plastics. I had not used the pastels in ages so forgot this but they really do look beautiful when used right. Basically you do the same as with the markers, trace & colour. 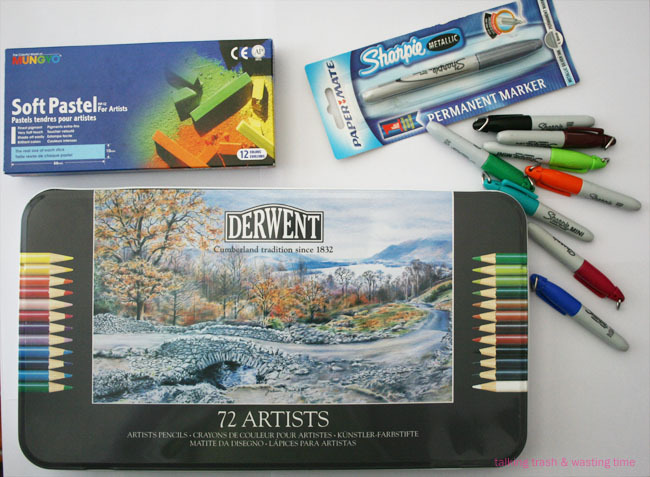 When pencils & chalks go onto the plastic they are very light and you think that you need to get it darker... YOU DON'T! When the plastic shrinks the colour will go bolder and pencil marks should blend together. 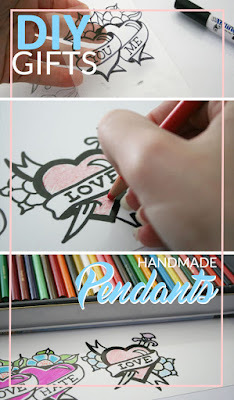 Here is some more examples of what you can do with pencils. 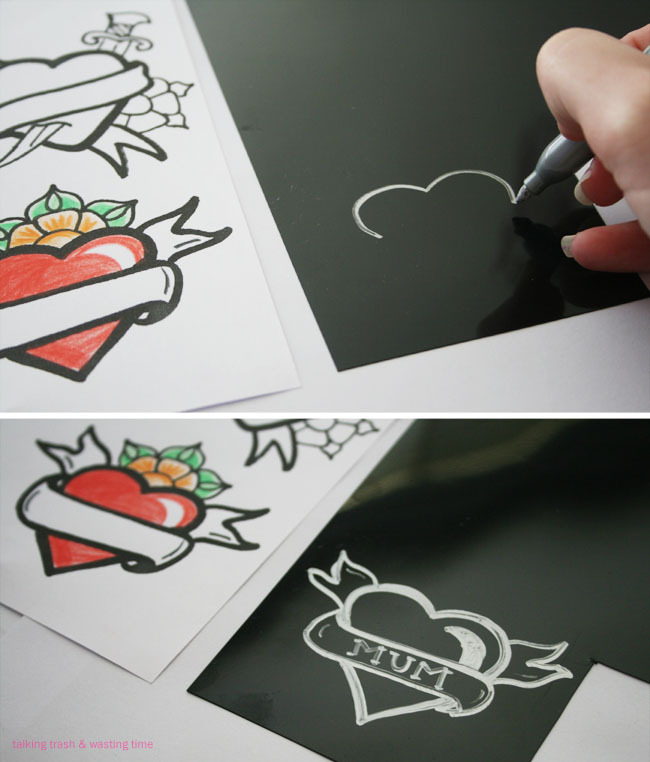 On the black plastic you really can not trace, so free hand drawing is the way to go. I just keep the designs simple on the solid colours. 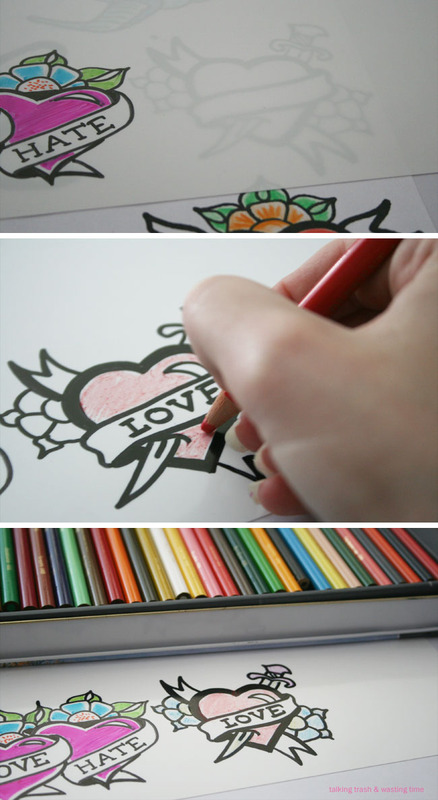 You can also use light colour pencils or chalks but I like the silver sharpie the best. Now cut your little heart out!!! If you are using these for necklaces or earrings then use a hole punch to cut your hole to place your o-ring in when attaching to the chain etc..
- Place a piece of cardboard or cooking paper on an old tray and place cut out plastic on it. - Put the tray in a pre heated oven. I had oven set at 150 degrees and placed tray on the middle rack. when they have shrunk you will notice they are not flat, they may have a slight bubble. This is easily fixed. With a thick piece of cardboard press down the plastic and keep heating. Be careful not to burn yourself. - Do not over bake as the plastic may stick. Above you can see the final result and the difference in size from the original design and how much they have shrunk when cooked :) You can also see how dark the colours have become. 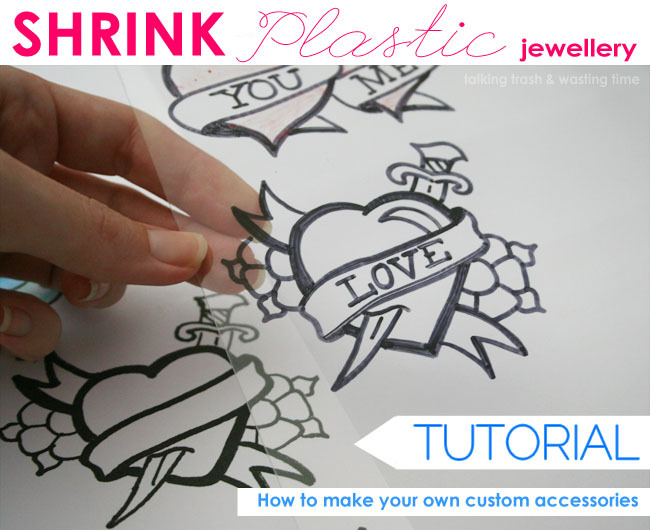 Here are some extra tips on using shrink plastic. 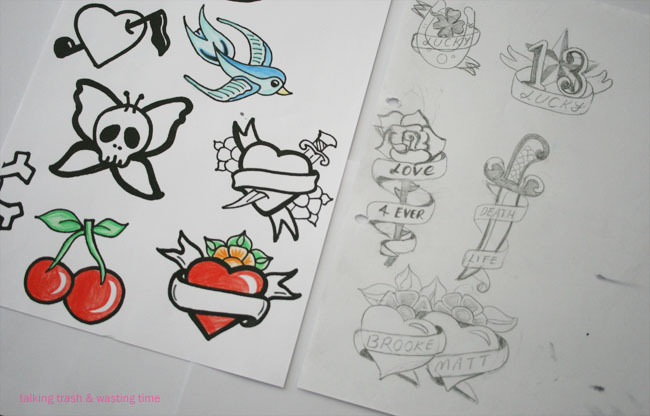 - Earring designs work best when traced. You get the exact same design in the same size this way. - The simple designs are the most effective. The more detail when large the more messy the design will look when it has got smaller. 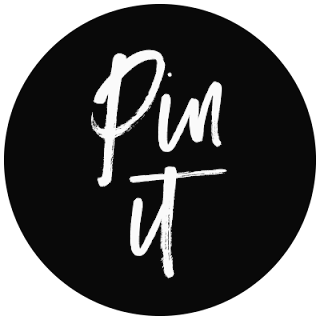 Share your designs with me. Thanks dear, I'm Following you back Now! Had no idea how the shrink plastic works! Really enjoyed reading about the process!